An important scientific paper (by Chakravarty et al. ), called Sharing global CO2 emission reductions among one billion high emitters was just published in the Proceedings of the [US] National Academy of Sciences. And because, as Greenwire notes, it “loosely builds on the idea of ‘greenhouse development rights,'” we’ve decided to write, and prominently feature, this a friendly rejoinder to it. The key point about the “one billion high emitters” paper is that it shares with the GDRs approach a central message, that the right answer to the “Who pays” question is, “The rich” (or at least the “unpoor.”) This, certainly, is the point that’s getting the most attention. See for example this review in the Daily Climate, this review in Reuters, and this review in Science Daily. In its essence, this effort by a noted team (that includes Princeton University’s Stephen Pacala and Rob Socolow of “stabilization wedges” fame) helps to shift the North/South debate in favor a more compelling — and empirically substantiated — rich /poor analysis. Despite sharing this viewpoint, we do have differences, one of which is important. Our basic critique is that the Princeton group frames the burden sharing question as a problem of splitting up the remaining — and largely depleted — atmospheric space. In doing so, they further introduce an emission cap that, in effect, serves as a selectively applied emission entitlement, which ultimately provides for a rather large subsidy from the poor to the rich. This gives, in the final analysis, a burden sharing framework that is even less fair to the poor than an equal per capita allocation, which, as we’ve noted before, is not and cannot be fair. Per-capita approaches are strongly identified with the Contraction and Convergence approach. This is as it should be, for C&C was the first real equity reference framework, and as such, it did a great deal to publicly establish the need for just, global effort-sharing as an essential aspect of an emergency climate stabilization program. But the simplicity that is one of C&C’s greatest virtues is also one of its greatest weaknesses. More particularly, in its focus on equality of emission rights, it loses sight of the end to which emission rights can only be a means sustainable human development for all, even in a world that is profoundly constrained by the prior overuse of the now-scarce atmospheric commons. This, as is turns out, is a key failing, because the atmospheric commons is now so critically depleted that any pretense to sharing it “equally” can only be misleading. Indeed, the very fact that “equal rights to the atmospheric commons” sounds so reasonable actually makes it a dangerous diversion from what, at this point, must be the real goal: equitably sharing the monumental effort involved in rapid global decarbonization. Per-capita approaches fail to deliver developmental equity for three fundamental reasons. First, they fail to account for the historical advantage acquired by the developed countries, who enjoyed decades of unrestrained emissions. That being the case, the developed countries are primarily responsible for the climate impacts now being witnessed, and are just as importantly much more able to now invest the resources needed for a global climate transition. Second, focusing solely on annual emission rates, they fail to account for the wide range of variation in other important national circumstances, particularly among developing countries but also among high-emitting industrialized countries, many of which (like Russia) now contain significant populations of poor people. But third, and most importantly, the underlying problem is that fairness does not and can not mean equal access to a rapidly diminishing global resource (i.e., emissions space). This is why GDRs, instead of attempting to equitably share the disappearing resource, shares the burden itself. That is, it allocates not emission entitlements, but emissions reduction obligations. The fact that the necessary emissions reductions will fairly rapidly exceed the available emission space is why it is the GDRs framework yields negative emission allocations to countries with high capacity and responsibility, whereas any system based on equal per capita emission rights could never do so. It is only by doing so that an effort-sharing framework can respect the right of the world’s developing populations to sufficient environmental space to support their development, in a world where that space has already been consumed by the world’s wealthy. Supporters of per-capita approaches have variously argued that these drawbacks are minor and can thus be ignored, or that modifications can be made to basic per-capita allocation scheme to improve their effectiveness and equity. We’ve considered these arguments carefully and over a long period of time, and concluded that it would be far better to take the South at its word, and to work toward a viable global climate stabilization framework with the right to development at its foundation, rather than taking equal per-capita emissions rights as its proxy. Our argument, in a nutshell, is that developmental equity, rather than emissions equity, must be the organizing principle of a viable climate framework. 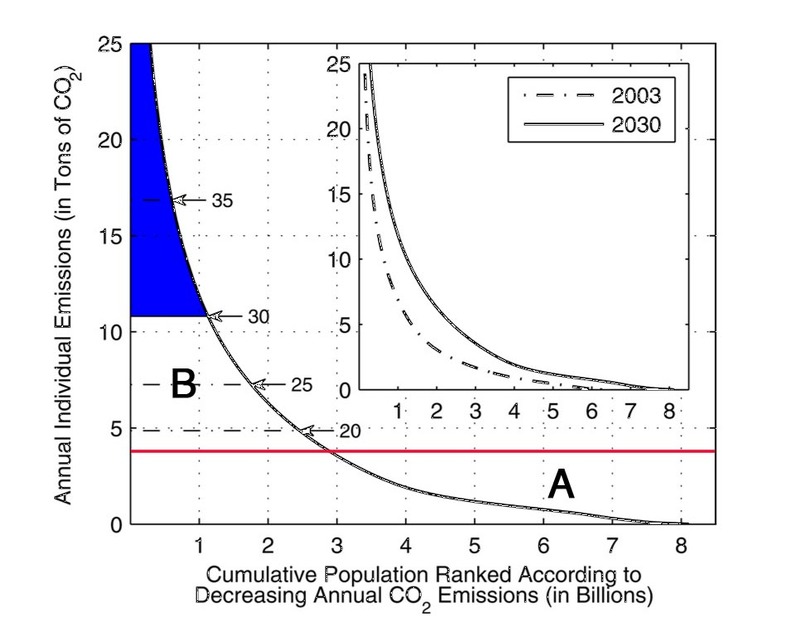 The problem with the Princeton-group proposal is that the net result of their “individual emissions cap” for the relatively high-emitting individuals is to allocate even less of the scant remaining atmospheric space to the poor, and thus to the developing countries, than they would get under a straightforward equal per-capita allocation. First of all, ignore the inset, and note that we have added the red line and the two big letters, which are not in the original. The blue area here represents the emissions above the “individual emissions cap” that the wealthy sub-population must either eliminate or pay for. This sounds reasonable, of course, since in some sense it reflects the world’s “excess” emissions. But now look at the red line, which we added to show the level of per-capita emissions (3.75 tons of CO2 per capita) that would correspond to the aggregate global mitigation budget of 30 GtCO2 considered in the Princeton paper. 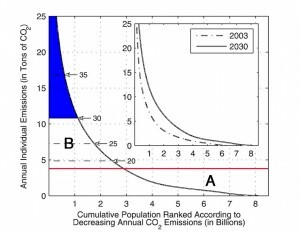 Note the large area (labeled “A”) above the global emission curve but below the red line, on the right side of the graph. This area corresponds to emissions space that is being given freely to the relatively wealthy, in effect treating as “excess” only those emissions contained in an area (the blue area) that is much smaller than the area that an equal per capita approach would treat as “excess” emissions (this area would include both the blue area and the area labeled “B”). In effect, the emission cap defined by the Princeton approach represents a transfer of emissions rights from the poorest (Area A) to the wealthier (area B). In consequences, this limits the obligation of the relatively wealthy to provide the finance and technology that would enable the poor to shift their development toward low GHG-pathways. As the individual emission cap rapidly shifts lower over time, the pressure on the poorer steadily mounts. The interesting point in all this is that the Princeton group sees the outcome of their system as a virtue. That is to say, they argue, in various ways (see their paper and the various quotes in the various reviews noted above) that their system will be seen as both realist and fair enough to break the international impasse. We, however, are not sure that this is a reasonable expectation. Important Southern delegations have already rejected the equal per capita framing. Further, the historical responsibility-based obligations of the rich are already squarely on the negotiating table, as are their capacity-based obligations. The Princeton group explicitly affirms its decision to ignore the former, but, interestingly, ignores the latter as well. These concessions to “realism” appear justified from the perspective of the North, but this is much less true from the perspective of the South, where, indeed, they appear as both unjust and unviable. Despite our problems with this proposal, we still feel that Chakravarty et al. make a valuable contribution, in that they point toward solutions that highlight the rich / poor divide. This is important work, and merits attention in spite of its shortcomings.